Michael, Leo and Andrew have very significant experience working with independent smallholder coffee farmers. I have been collaborating with them as part of the work I do supporting this group of farmers. We believe in the potential of this group of farmers to create a more sustainable coffee industry so I wanted to summarize our discussion in this post. Independent Smallholders: Why should the coffee industry care? Industry’s supply chain is in jeopardy! 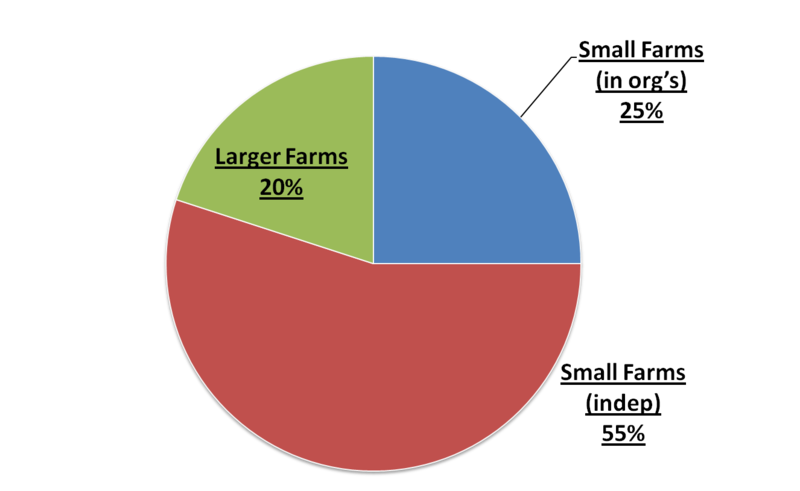 Based on this and in previous estimates from the Neumann Foundation, here is graph that shows why independent smallholders are an important group: They account for the majority of coffee farmers! 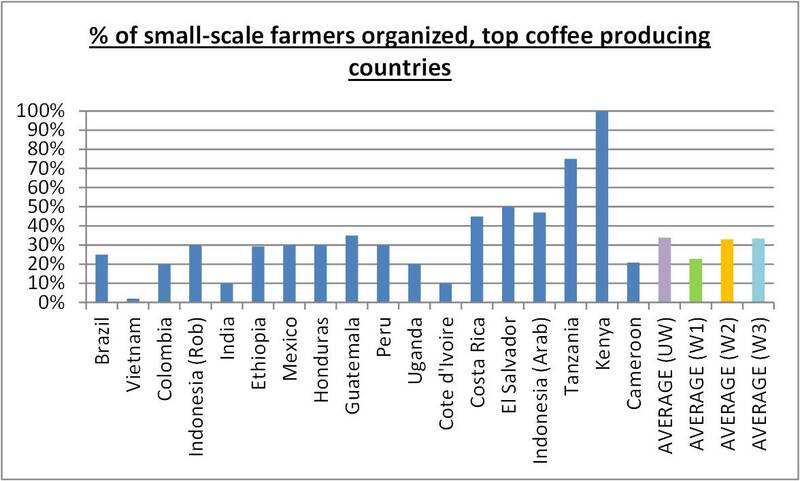 Estimated coffee farmers share by size/type. Source: NKG 2010/2013. Graph created by M Zamora for SCAA presentation in 4/2013. Quality: coffees with probably the most quality potential in the world. Right now, a lot of the coffee coming from independent smallholder comes to the U.S. with tons of defects, mixed with other “defective” coffee. That does not have to be the case: Independent smallholder coffees come from communities/regions that are similar to areas that produce some of the best coffees in the world. With the right access to resources and information, independent smallholders could significantly increase the availability of great quality coffees. Traceability: learning where most of the coffee actually comes from, where those communities are, who the farmers are. Right now, most independent smallholders’ coffee comes to the U.S. “faceless”, without roasters and consumers really knowing where that coffee was produced. Smallholders tend to produce 5 to 50 bags of green coffee but containers coming to the U.S. are filled with 250-320 bags. Being able to fill a container could give farmers chances to reach more buyers more directly since a container is, in many cases, the minimum amount of coffee that an importer will bring to the U.S. Coffee from independent smallholders needs to be aggregated by someone. Farmers, when organized, will have a better chance to aggregate their coffee and reach markets more directly. In most cases, coffee changes hands multiple times. When farmers are organized, coffee goes more directly to the exports market. This will also mean more value in the pocket of farmers. During the panel, Michael shared information about independent smallholder farmers he worked with in Nariño, Colombia, where only 4% of surveyed farmers were receiving quality-based premium. 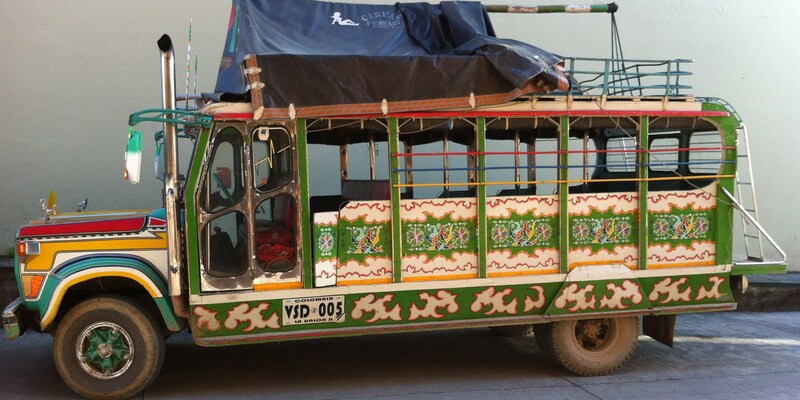 For a region with such great coffee (in 2010 Cup of Excellence, 8 of top 10 places in Colombia were from Nariño), this would show that there is a disconnection between quality potential and what farmers could receive for their coffee. Farmer organizations bring benefits to farmers that allow them to reduce costs of production, improve capacity and quality, and get higher value from coffee prices. During the panel, Andrew had information about a project in Uganda where farmers increased yields by 100% and income by 250% due to creating democratic, transparent and effective farmer organizations. – If you are a coffee roaster or work in the coffee industry, you can support a more sustainable industry by making sure the coffee you buy comes from farmers who are growing coffee in a sustainable way and have access to prices, information and resources that make coffee production a viable alternative. How? – Since most of the coffee farmers in the world are independent smallholders, ask questions to your importer or provider? Who are the farmers growing this coffee? What is the cost of production of those farmers? What is the farm gate price farmers received for that coffee? – Support organizations and initiatives that help independent smallholders to create farmer organizations. If you want to learn more about our work supporting independent smallholder coffee farmers (for any of the four of us panelists), leave a comment here and I will get back to you. Being the majority of coffee farmers and having a great potential to improve quality, traceability and sustainability, independent smallholder coffee farmers present an important opportunity for the industry to create more sustainable supply chains. Finding ways to make coffee production a viable and sustainable alternative for this group should be a goal of the specialty coffee industry. We will all benefit from that. This entry was posted in Making the case, Small farmers. Bookmark the permalink. Buen dia Miguel, Andrew and Cia, very interesting angle to increase sustainability in our coffee communities. Being and independent coffee trader and exporter, I am very much interested to cooperate in anything that you may need here in Honduras. Thank you for the comment, Jimmy. Cooperation with every link in the chain is necessary to achieve more sustainable coffee farming communities. Hopefully this panel at the SCAA show will allow to continue the discussion and to support independent smallholder farmers. This is the reality on the ground for the coffee industry in Kenya, and I guess it also gives the farmers, through their co-operative societies greater bargaining power especially if they are working with an aggressive marketer. The synthesized information are very interesting. And they reflect the reality in Brazil, especially in the coffee regions of the Chapada Diamantina Plateau and Vitória da Conquista, Bahia in both, and the Zona da Mata in Minas Gerais. Thanks for the comment. The situation you describe is common for other cooperatives and regions I have visited. Right now I am trying to work with a group of farmers in Peru who are organized in a cooperative but want to support farmers who are selling their coffee independently. Since there is a buyer interested in buying that coffee through the co-op, that is helping the process since there are bigger incentives for the independent farmers to worker closely with the co-op. as we speak I am starting a new business model. We a buying and selling coffee from small holders. First we pre-finance the coffee which we sell on the European and American Market to small roasters. After we sold the micro-lots we share the profit we made with the small holders. I would like to meet you and discuss this new business model.